We've been experiencing an unusual January warm stretch, but that came to an end last night and we're back in the deep freeze starting today. The thing that will make for an interesting day is that it was raining for the past day - yes, raining in the middle of winter in Minnesota. That means that everything will have frozen overnight, and although I doubt I'll have anything this pretty to look at, walking might be very challenging for a while until salt gets laid down. 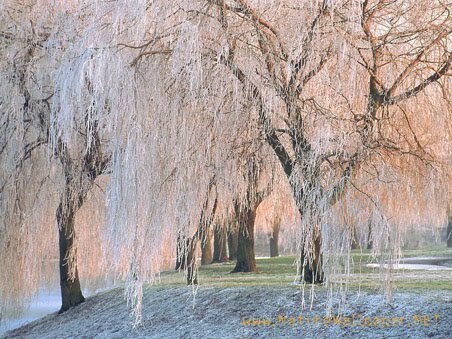 I thought I'd share four very lovely photographs of winter ice for today. reminder of the beauty that can be found in these low temperatures. another. The lighting on this picture just makes it sing. water that looks like melting candle wax. of trees with great background lighting. I love this shot. Current Location: Looking forward to coffee and oatmeal. 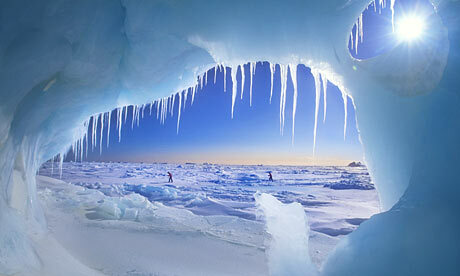 The picture of the ice cave looks like it is taken from within a huge mouth. Ian't it marvelous? I truly love all of these, but the colors of the sky just hit me with this one. 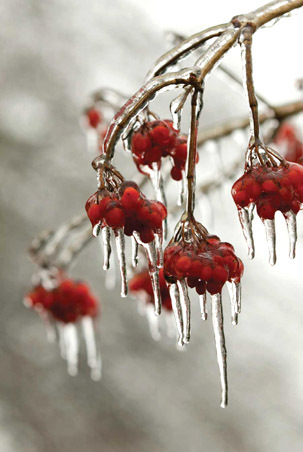 I remember the cold, fresh, exhilarating taste of icicles. Your shots are taking me back in time to a wonderful, wintry childhood. Winter is wonderful when you're a child. Sledding down hills, snowball fights and snow forts, ice skating and hockey, snow skiing - downhill and cross-country. All good. When you're an adult and you have to drive in the S--T...well, then snow becomes less beloved because then you're fighting it instead of embracing it. I'm delighted I could bring back good memories to you. I love the berries and the trees swathed in winter. 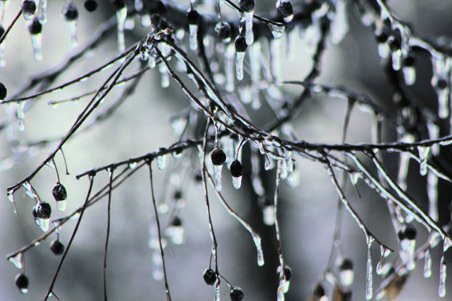 Winter can be such an incredibly beautiful season, although very deadly as well.